August 2015 issue on sale now! | What Hi-Fi? August 2015 issue on sale now! 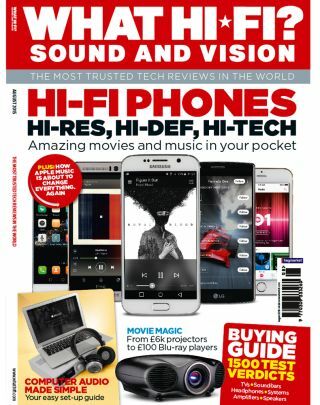 Budget Blu-ray players, premium projectors, and musical smartphones are just some of the highlights from the August issue of What Hi-Fi? magazine. Throw in a guide to building your own audio network, and everything you need to know about DACs, and you've got an issue that can't be missed! Ultra HD Blu-ray players are on the horizon, but now is the time to grab yourself a bargain Blu-ray spinner. After all, 4K Blu-ray discs won't appear in their thousands overnight, so a standard machine will be able to play the majority of movies on our shelves for some time to come. Sony was king of the budget deck in 2014, but a new year brings new models from all the usual suspects, including Panasonic, Samsung and LG. If you're drowning in a sea of recently ripped digital music files, or want to convert all your physical music from vinyl or CD into megabytes, then we've got the perfect feature. We take you through the who, what, why and how of creating a smart networked system for your music collection. Phones aren't just smart these days, they're powerful multimedia players capable of playing high-res music and high-def video. In our August supertest we put eight of the best newcomers through their paces, ranging from the shiniest, priciest flagship phones from Apple, HTC, LG and Samsung to smaller, more cheerful budget models from Acer, Alcatel, Huawei and Honor. There's something for everyone - but there can be only one winner. Your expensive surround-sound system deserves a thrilling picture, and there's no doubt Sony and Epson are two of the best in the business at delivering one. We pitch Epson's first high-tech laser projector, the EH-LS10000, aginast a formidable 4K rival, in the shape of Sony's VPL-VW300ES. Our regular features serve up some quality kit, with First Tests showcasing Sony's latest budget AV receiver, the STR-DN860, Cambridge Audio's CXA60 stereo amplifier and Chord Electronics' Chord 2Qute DAC. Panasonic's TX-40CX680B shows there's mileage in smaller 4K TVs, while Jamo's C103 bookshelf speakers put forward their case for inclusion in your hi-fi system. Meanwhile, this month's Temptations include a striking pair of £10k Tannoy Kensington GR loudspeakers, and an equally eye-catching CD streamer from Burmester, the £12,500 Musiccenter 151. And don't forget, you can download the digital edition of the magazine directly to your smartphone or tablet.